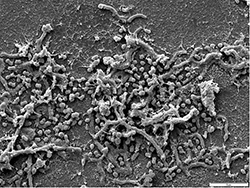 Perio Protect LLC is consulting with one of the world’s leading microbiologists to use scanning electron microscopy (SEM) to complete cellular evaluations to determine the effects of the Perio Protect Method™ on the infection causing subgingival biofilm. METHOD: Flexible polycarbonate carriers were placed into two 6 mm pockets and one 5mm pocket for 2 days allowing the subgingival biofilm to colonize the carrier. Carriers were inserted before and during treatment using the Perio Tray™ with Perio Gel and Sumycin and subsequently examined by SEM at different time intervals and bacterial counts were completed (Schaudinn and Costerton). RESULTS: Cell analysis before treatment with the Perio Protect™ system determined the pocket ecosystem consisted of large numbers of fusiform-like bacteria, cocci-like, short rods and in one pocket, treponema-like. After two days using the Perio Tray most of the fusiform bacteria and treponema had disappeared. After 17 days there were less than .02% of the periopathogenic bacteria (99.98: kill) and what remained were some cocci-like and pleomorphic rods that were visible next to large numbers of eukaryotic cells. CONCLUSION: In this clinical case, the direct application of medication using the Perio Tray radically modifies the microbial ecosystem of periodontal pockets, so that only a few bacteria species and bacteria cells are capable of forming small colonies. SEM cell counts at 17 days determined that greater than 99.98% of the periopathogens were eradicated. The study confirms that the Perio Protect Method is effective in managing the microbial challenge by killing the periopathogens. Above are Before treatment (left) and after 17 days of Perio Protect treatment (right), both scales represent 5 μm. Watch the presentation below for more SEM pictures. Counting the bacteria/unit area demonstrates that 99.98% of the bacteria have been eradicated in 17 days. The few remaining bacteria, cocci- and actinomyces-like, are known as a normal aerobic microflora of healthy gums. To view a presentation documenting this research study Click Here. Objective: Pilot study to monitor blood levels of C-reactive protein (CRP) while treating periodontal disease in patients with and without co-morbidities. Methods: A retrospective analysis of clinical records from January 1-August 1, 2006 from a general dental practice was performed. Records with complete documentation and informed consent were included in the study. The resulting 29 patient sample included 19 females, 6 smokers, 2 patients with diabetes, 8 patients with cardiac disease and an age of 52.9+12.6 years. Three patients exhibited no periodontal disease, 3 had gingivitis, and 23 had periodontitis. All patients with signs of periodontal disease began treatment on day 1 (baseline) with the Perio Protect Method per established guidelines. Blood CRP samples were taken at day 1 and 14 days later through a standard clinical analysis (QuikRead CRP, Orion Diagnostica). All CRP values in the normal range were assigned a “4” for subsequent data analysis. Descriptive statistics were used to describe group differences. Results: In the no periodontal disease group, the baseline and 14 day CRP values were 4 mg/L. In the gingivitis group, baseline CRP values were 8.0+5.3mg/L (range=4-16) while 14 day CRP values were 4.0+0.0mg/L. In the periodontitis group, baseline CRP values were 7.7+5.7mg/L (range=4-27) while 14 day CRP values were 4.6+1.4mg/L (range=4-10). All normal values at baseline regardless of group stayed normal at 14 days. The baseline CRP values for smokers were 8.5+4.8mg/L (range=4-16) while 14 day CRP values were 4.3+0. mg/L (range=4-5). For the 10 patients with diabetes or cardiac disease, 100% of the baseline CRP readings were greater than normal (9.7+6.9mg/L; range=5-27). At 14 days, 70% were within normal (4.6+1.1mg/L; range=4-7) for an average decrease of 5.1+6.9mg/L (range=0-23). Conclusion: The Perio Protect Method produced a decrease in 14 days in the blood CRP levels in all patient population groups examined. Study of the Perio Protect™ Treatment for Periodontal Disease – Abstract: 2006 AADR and ADEA Annual Meeting. A new treatment regimen, Perio Protect Method™, is being used to treat all stages of periodontal disease. While clinical response has been positive, this study systematically examines this method that uses prescription trays to direct medications into the gingival sulcus. Objective: To evaluate outcomes of the Perio Protect Method. Methods: A retrospective analysis of a small study compared pre-treatment and six months post-treatment records. Sequential subjects with at least one molar in all quadrants and no standard periodontal treatment for 6 months pre-study were chosen to complete 6 months of the Perio Protect program. Disease severity was assessed by probing pocket depth (PPD) and bleeding and established treatment frequency and duration. Teeth exhibiting the worst symptoms of periodontal disease (PPD=5.7±1.8; range= 4-9) and those with the least evidence of disease (PPD=1) were considered in the subsequent analysis. Data was analyzed using paired t-tests. Results: Patients exhibited bleeding pre-treatment (20.7±14.0 sites). A significant decrease occurred post-treatment with bleeding (2.7±4.4 sites; p=0.002). No patients developed any new bleeding sites post-treatment. A significant change in PPD occurred in the most severely diseased teeth with post-treatment PPD of 3.0±2.1 (p<0.0001). The percentage of closed pockets (PPD≤3 mm) in this group post-treatment was 70.8%. All teeth in the least severe range stayed within the normal range post-treatment (PPD≤3 mm). Conclusions: Treatment outcomes indicate the Perio Protect Method is effective in treating periodontal disease. Further studies are necessary to examine its effect on different patient populations over longer treatment times and to compare it to gold standard treatments. World Health Organization Report: 2003. • This paper was prepared by The Research, Science, and Therapy Committee of The American Academy of Periodontology and is intended for the information of the dental profession. Routine scale and polish for periodontal health in adults. Cochrane Database Syst Rev. 2005 Jan. 25 (1). • Disease can be minimized through effective plaque control. J Perio1979 Oct 50 495-09. Periodontal antimicrobials – finding the right solutions. Int Dent J 2005 Feb 55 (1) 3-12. • A combination of brushing interdental cleaning and chemotherapeutic agents are beneficial in managing periodontal disease. Antimicrobials for the treatment of aggressive periodontitis. Oral Diseases 2003, 9 (suppl. 1), 51-53. • In recent publications (Slots and Jorgensen, 2002, Slots and Ting 2002, Walker and Karpinia, 2002) the use of antimicrobials as an adjunct to mechanical therapy has been regarded as beneficial to improve the therapeutic outcome. Non-surgical periodontal therapy – where do we stand now. No single antibiotic is effective in controlling periodontal disease. Rather a combination with scaling and root planing has proven most effective. Shiloah J, Patters MR, Dean JW 3rd, Bland P, Toledo G.
The prevalence of Actinobacillus actinomycetemcomitans, Porphyromonas gingivalis, and Bacteroides forsythus in humans 1 year after 4 randomized treatment modalities. 1) scaling and root planing; 2) pocket reduction through osseous surgery and apically-positioned flap; 3) modified Widman flap; and 4) modified Widman flap and topical application of saturated citric acid at pH 1 for 3 minutes. • Patients rinsed with 0.12% chlorhexidine for the first 3 months postoperatively and received a prophylaxis every 3 months. • The choice of treatment modality did not affect the prevalence of the target species at 1 year post-treatment. These results suggest that prevalence of microbial pathogens negatively affects the 1 year outcome of periodontal surgical and nonsurgical therapy. Local delivery of antimicrobials: a new era in the treatment of adult periodontitis. Compend Contin Educ Dent. 1999;20(4 Suppl):13-8; quiz 34-5. • This article discusses the principles, products, and techniques currently available for local delivery of antimicrobials in the treatment of adult periodontitis. Four principles provide the scientific basis for the treatment of periodontitis: it is caused by bacteria; it cannot be cured, but it can be controlled; clinicians cannot remove all the plaque and calculus; and periodontitis re-infects. This article stresses how the local delivery of antimicrobials can help the clinician achieve the goals of arresting the disease and maintaining the disease in the arrested or controlled state. Rationales for reevaluating the treated patient and treatment options are presented. Local-delivery systems are reviewed, stressing those available in the United States. Pharmacokinetics, multi-center randomized trials, and techniques are presented. Marshall MV, Cancro LP, Fischman SL. Hydrogen peroxide: a review of its use in dentistry. • Hydrogen peroxide has been used in dentistry alone or in combination with salts for over 70 years. Studies in which 3% H2O2 or less were used daily for up to 6 years showed occasional transitory irritant effects only in a small number of subjects with preexisting ulceration, or when high levels of salt solutions were concurrently administered. This (and later) studies have shown that at 3% or less, no cocarcinogenic activity or adverse effects were observed in the hamster cheek pouch following lengthy exposure to H2O2. In patients, prolonged use of hydrogen peroxide decreased plaque and gingivitis indices. However, therapeutic delivery of H2O2 to prevent periodontal disease required mechanical access to subgingival pockets. Furthermore, wound healing following gingival surgery was enhanced due to the antimicrobial effects of topically administered hydrogen peroxide. Katsuragi H, Ohtake M, Kurasawa I, Saito K.
Intracellular production and extracellular release of oxygen radicals by PMNs and oxidative stress on PMNs during phagocytosis of periodontopathic bacteria. • Both the intracellular and extracellular oxygen radical production by PMNs phagocytosing F. nucleatum was significantly greater than that of PMNs phagocytosing P. gingivalis and A. actinomycetemcomitans ( P < 0.01 by the Mann-Whitney test). Moreover, after 4 h of incubation, the oxidative stress of PMNs phagocytosing F. nucleatum was significantly greater than that of PMNs phagocytosing P. gingivalis and A. actinomycetemcomitans. We conclude that a high level of superoxide production by PMNs may damage not only periodontopathic bacteria but also PMNs themselves, and may be correlated with the destruction of periodontal tissue. Firatli E, Unal T, Onan U, Sandalli P.
J Clin Periodontol. 1994 Nov;21(10):680-3. Antioxidative activities of some chemotherapeutics. A possible mechanism in reducing gingival inflammation. • Inflammatory periodontal diseases are related to dental plaque formation. Increase in the perfusion of the inflamed tissue results in increased oxygen supply. Although oxygen has healing effects, it is bound to be a mediator of peroxidation in biological membranes. Chemotherapeutic agents such as chlorhexidine, listerine, sanguinarine, and cetylpridinium chloride and oral antibiotics such as tetracycline HCl and doxycyline were tested for their antioxidative activities. While doxycycline has the highest antioxidant activity in lower volumes (0.1 ml), sanguinarine, listerine and a pace after them, tetracycline HCl, had similar effects in higher volumes (0.3 and 0.4 ml). The results showed that in addition to their antiseptic or antimicrobial effects, these preparations have an antioxidative activity against spontaneous oxidation. Bezerra MM, Brito GA, Ribeiro RA, Rocha FA. Low-dose doxycycline prevents inflammatory bone resorption in rats. Braz J Med Biol Res. 2002 May;35(5):613-6. • The data show that doxycycline inhibits inflammatory bone resorption in a manner that is independent of its antimicrobial properties. Donahue HJ, Iijima K, Goligorsky MS, Rubin CT, Rifkin BR. Regulation of cytoplasmic calcium concentration in tetracycline-treated osteoclasts. J Bone Miner Res. 1992 Nov;7(11):1313-8. • Tetracyclines can enter the osteoclast and bind calcium. • Tetracycline pretreatment significantly decreased the cytosolic Ca2+ response to extracellular CaCl2. • Tetracyclines have a specific effect on extracellular Ca(++)-stimulated cytosolic Ca2+ mobilization in osteoclasts. • Tetracyclines trigger an attenuated signal response associated with decreased osteoclastic resorption. Holmes SG, Still K, Buttle DJ, Bishop NJ, Grabowski PS. Chemically modified tetracyclines act through multiple mechanisms directly on osteoclast precursors. • Osteoclast formation over 20 days was completely abrogated when tetracycline derivatives doxycycline and minocycline (concentration of 250 ng/ml) were included in cell cultures. Mulari MT, Qu Q, Harkonen PL, Vaananen HK. Osteoblast-like cells complete osteoclastic bone resorption and form new mineralized bone matrix in vitro. Calcif Tissue Int. 2004 Sep;75(3):253-61. • Osteoblast-like cells, not macrophages, remove the remaining organic materials. 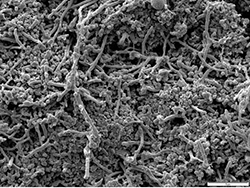 After cleaning the lacuna, osteoblast-like cells deposit new collagen fibrils and calcify the newly formed matrix as visualized by tetracycline accumulation. To see what others are saying click here. Perio Protect in the news! Click here to watch a 5 minute video segment.